ATLANTA — Kenneth Calhoun is the new chairman of American Trucking Associations’ Technology & Maintenance Council, taking over the one-year leadership position at TMC’s closing banquet during its annual meeting on March 20. Calhoun is the fleet optimization manager for Altec Industries of Birmingham, Ala., and has been a longtime board member of TMC. 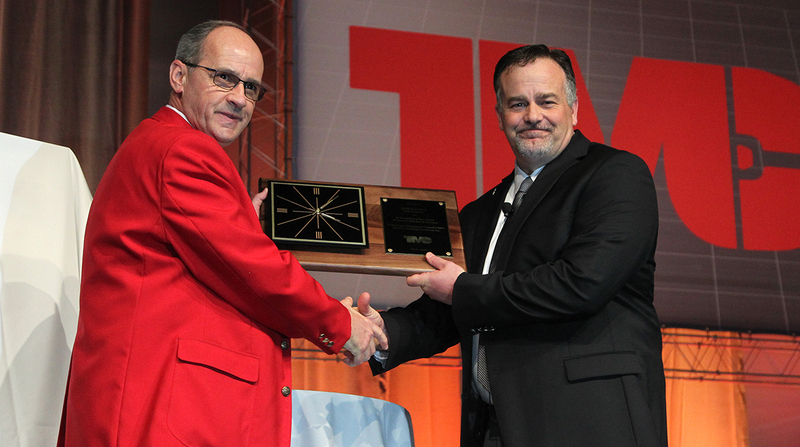 In his final minutes as outgoing chairman, Jeff Harris, the vice president of maintenance at USA Truck, told the audience he was pleased with the growth and momentum TMC and the trucking industry had experienced in the past year. “It has been a great year at TMC and we have seen some really fantastic things happen at TMC. Our membership continues to increase, we are in the process of developing our next five-year plan and we have really strengthened our relationship with ATA,” Harris said. When he took office a year ago, Harris said one of his top priorities would be to work to bring more technicians into the trucking industry. Earlier in the day TMC graduated the inaugural class from its TMC of Tomorrow Leadership Development Program. This effort is designed to continue forming the next generation of leaders within TMC and the trucking industry. Calhoun said one of the other issues that is important to him concerns the industry’s efforts to develop more technicians. While it does not receive as much attention as the industry’s driver shortage, trucking faces a critical shortage of technicians. The U.S. Labor Department reported that employment of diesel service technicians and mechanics is projected to grow by 12% from 2014 to 2024, faster than the average for all occupations. The government said 67,000 technicians will be needed to replace retired workers, and 75,000 new mechanics must be added to meet additional demand by 2022. The evening ended with entertainment by comedian and actor Frank Caliendo, who spent an hour on stage performing impressions of presidents Donald Trump, Barack Obama, George W. Bush and Bill Clinton, as well as actor Morgan Freeman, basketball analyst Charles Barkley and retired NFL coach John Madden.